Few items of fictional clothing are more iconic and easily recognisable as the ruby slippers worn by Judy Garland in the 1939 classic, The Wizard of Oz. Thanks to a combination of human error, poor record keeping and a sticky fingered ne’er-do-well, these simple pieces of footwear are now considered one of the most valuable film props in history. Figuring out exactly how much the slippers are worth is no small feat because there are currently only four pairs known to exist and they very rarely appear at auctions. To make things even more difficult, one of the pairs was stolen from the Judy Garland Museum in Minnesota in 2005, meaning there are only three pairs currently in existence that we know the whereabouts of. One of these pairs currently resides at a permanent exhibit in the Smithsonian where they’re displayed amongst other treasures from pop-culture history like one of Mr Rogers’ sweaters (made by his mother), one of Michael Jackson’s hats, and one of Tony Hawks’ skateboards. This particular pair were given to the museum by an anonymous donor who is believed to have bought them in an MGM auction in 1970 for $15,000 (about $88,000 today). A second pair is currently in the possession of the Academy of Motion Picture Arts and Sciences who acquired them in 2012 when a collection of Hollywood bigwigs including Leonardo DiCaprio and Steven Spielberg pooled their pocket change together to buy them at auction. The price they paid has never been revealed, but it’s rumored to be around the $3 million mark. The third known pair were purchased by a private collector called David Elkouby in 2000 from an auction at Christie’s for $666,000 (Almost $1,000,000 today). Elkouby has yet to display the slippers and seemingly has no desire or need to sell them. The final, stolen pair has been missing since 2005. However, in the years since, an anonymous and apparently very wealthy fan of the movie has put up a million dollar reward for information leading to their return. As for how many pairs of the slippers existed in the first place, according to the film’s producer, Mervyn LeRoy, between 5 and 10 pairs were made, each sporting slight variations to better accommodate the lighting and look of different sets. For example, several pairs had a thin layer of orange felt along the sole to muffle the sound of steps and dancing. The pair reserved for close-ups didn’t need this felt and due to their minimal use, are in amazing condition, sporting only slight scuffs from Garland clicking her heels. All of the shoes were created by legendary costume designer Adrian Adolph Greenberg who crafted them from plain white pumps that were dyed a deep shade of red before being coated in dark “reddish-orange” fabric, onto which thousands of sequins and eventually a large bow were attached. Adrian coated the pumps in dark red sequins instead of bright red ones because the Technicolor process would have made bright red shoes look orange on screen. Likewise, the sparkling effect seen throughout the movie was added in post-production using optical effects. For this reason, surviving examples of the shoes are kind of underwhelming compared to how they look on screen. Speaking of Technicolor, in the original Wizard of Oz novel, the shoes Dorothy wears are silver. However, the film’s screenwriter, Noel Langley, decided to make them bright red to better take advantage of Technicolor; he felt that silver shoes wouldn’t stand out against the bright yellow road Dorothy would be standing on for nearly half of the movie. Although a great deal of care was put into making the shoes, after filming wrapped, the known surviving pairs were shoved into a wardrobe somewhere deep in MGM’s expansive costume department where they remained until the aforementioned 1970s bulk auction. Seemingly the only person aware of the value of the shoes was a man called Kent Warner, an MGM costumer designer who quietly pilfered hundreds of items from MGM over the years, including a pair of the ruby slippers which he took while helping catalogue items for the 1970 auction. Warner kept the best pair of the ruby slippers for himself, never displaying or sharing them with the public until he sold them in 1981 (this is the pair currently believed to be in the hands of the Academy of Motion Picture Arts and Sciences). Interestingly, until the 1970 MGM auction, it was believed that only one copy of the shoes existed and they belonged to a woman called Roberta Bauman who won them by placing second in a movie trivia contest in 1949. Bauman’s pair is considered to be the least valuable since they are believed to have belonged to Judy Garland’s stunt double, Bobbie Koshay, who had slightly larger feet. This is the pair purchased by Mr. Elkouby in 2000 for $666,000. A fifth pair of ruby slippers only worn by Garland in test shots known as “the Arabian slippers” also is known to still exist. These slippers are far more ornate, sporting curled toes and brighter sequins. The design was passed over in favour of Adrian’s simpler, pump design which everyone felt suited Dorothy’s “farmgirl” image. In 1990, a jeweller called Ron Winston made an actual pair of ruby shoes containing over 2000 rubies and 25 carats of diamonds to celebrated the 50th anniversary of the film. The pumps were valued at $3 million (about $5.5 million today) and were a petite size four. Winston loaned the shoes to the Make-A-Wish foundation to help with fundraising efforts. According to Frank Baum, the author of the original Wizard of Oz novel, the name “Oz” is a nonsense word he came up with while looking around his office. Specifically, I read that “Oz” came from Mr. Baum looking at his file cabinet, at the drawer labelled: “O-Z”. There are so many grammar mistakes in this article one would think that it was written by a high-school dropout. “three pairs currently in existence that we know the whereabouts of”, should be “of which we know the whereabouts”. “This particular pair were given” should be “this particular pair was given”. The word “pair” is not plural. “but it’s rumored to be around the $3 million mark”. What’s the difference between “the $3 million mark” and $3 million”? Why add the word “mark”. There are many more. This is just horribly written. If you’re going to write for others to read, at least try to be good at it. I used to work for Warner Leroy in NYC. Warner was the son of Mervyn Leroy, the producer of the movie. 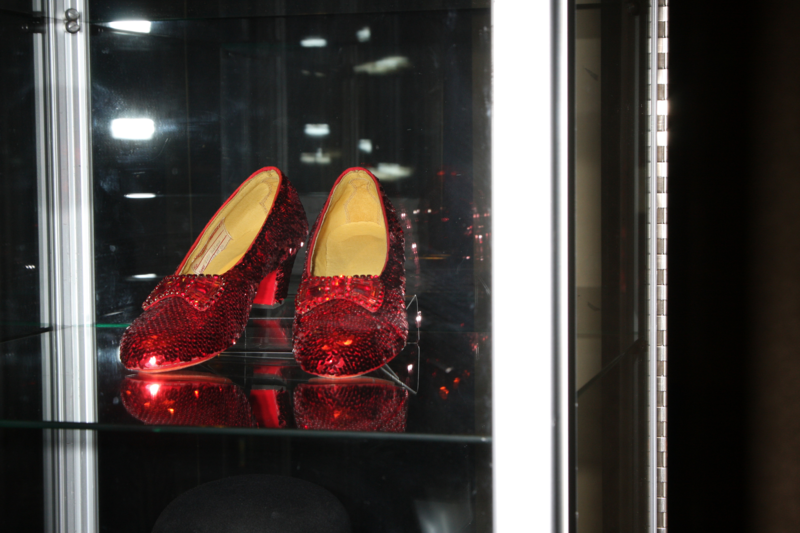 There was a pair of the ruby red slippers in a safe in the basement of our offices on E. 63rd St.